I have been becoming more interested in fermented foods lately and the benefits for our health. I discovered that the Community Farm Store in Duncan carried products from Cultures for Health. On a day trip in the fall I went in and found that they had Water Kefir, Milk Kefir and Thermophilic Cultures for making cheese. Kefir which can be pronounced either kee-fur or kuh-feer is typically a fermented milk drink that has been around for thousands of years. I’ll be trying to make this next. 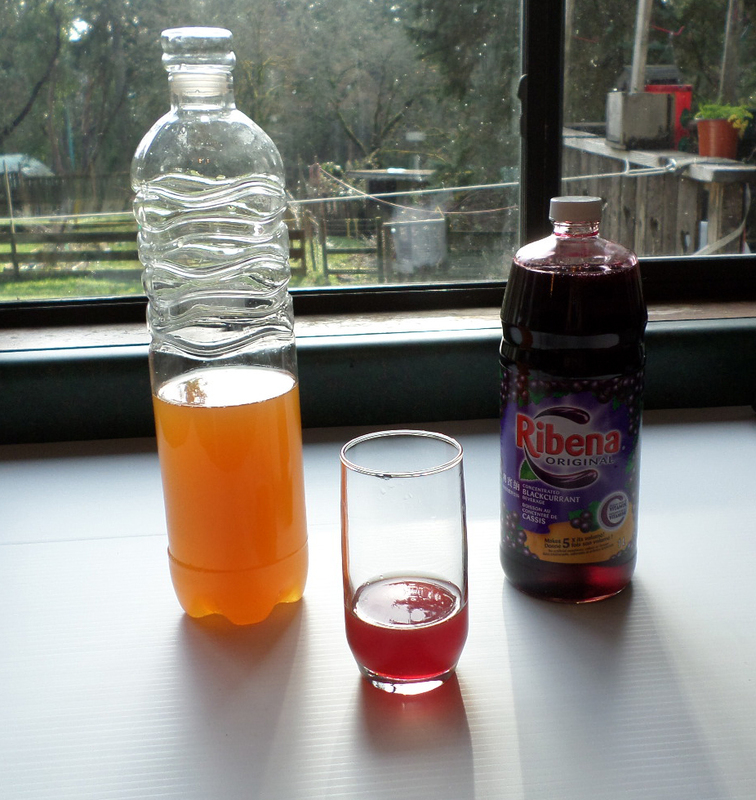 Water kefir is a carbonated lacto-fermented drink. I decided since I am somewhat lactose intolerant this would be a good place for me to start. 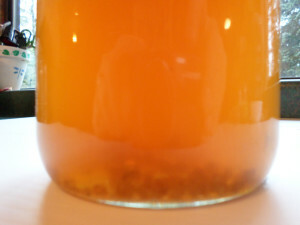 The website said this was easy product to start fermenting, which I found to be quite true. You can either use a sugar water mixture or juices. I had organic cane sugar from Level Ground Trading which I used to make the sugar water solution. These are the grains, they are good bacteria and yeasts in a symbiotic relationship. The recipe was included in the package. I also watched the instructional video on the culturesforhealth.com website. First you have rehydrate the kefir grains. I collected all the things I would need to rehydrate the grains. 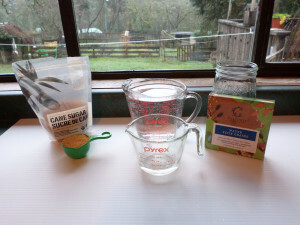 The first step was to take a clean (really really clean) jar add ¼ cup of the organic cane sugar and dissolve in a small amount of very hot water. Once I had the sugar dissolved, I added cold water to fill the jar. You want to end up with room temperature water. 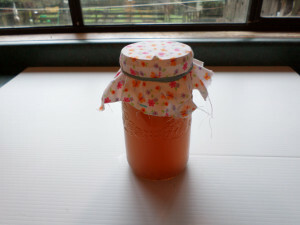 Next I added the water kefir grains and then covered the jar with a cloth. As the grains rehydrate they will create some gas which you want to be able to escape. Next I labelled the jar so that I would remember when it should be done. You then wait (rather impatiently in my case) for 5 days. Each day the grains looked a little plumper. 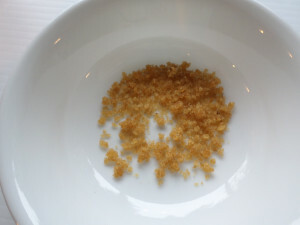 After 5 days you pour off the used sugar solution and catch the grains in a sieve. They recommend a plastic sieve as metal can react with the grains. You repeat the process of making the sugar solution and add the grains. Now you wait 24-48 hours. 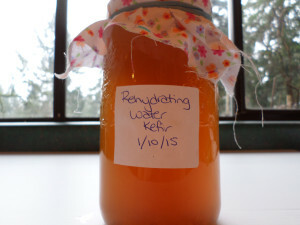 I waited the 48 hours, drained off the water kefir and started a new batch. I really liked the flavor of the plain water kefir. It was slightly sweet, slightly carbonated and yet it felt like it had some body to it. I also added a small amount of Ribena which was lovely. Probiotics are helpful to enhance the good bacteria in your gut. Drinking these bacteria leads to colonization and then hopefully to a healthier digestion and immunity. I guess I will see if I notice any changes in my health. Just wondering how the kefir water is going, have you noticed any changes in health? I wonder if it will help my asthma, not using any lactose products, and help the cough. Hi Donna, water kefir is a probiotic which helps your digestion system. Probiotics contain “good” bacteria which help digest your food, and can help prevent food sensitivities and allergies, as well as helping boost your immune system. Fermented foods are a great way to get your probiotics. I’m not sure whether it would help asthma, but if it helps strengthen your immune system, that will be beneficial. I haven’t had any illnesses and feel that I am increasing my health and wellness, as well as dropping a few pounds. I had no idea one could make water based kefir – I always thought it was milk based. I see that Lifestyles Market has some starter for milk kefir. I might give it a try, since I’m unlikely to make it up to Duncan anytime soon for the other kind :). I’ve read about kefir in a book on fermenting, and it makes sense, kind of like the probiotics in natural yogurt. Have you ever tried kombucha? Because that one seems weird to me. Hi Dawn, give milk kefir a try. 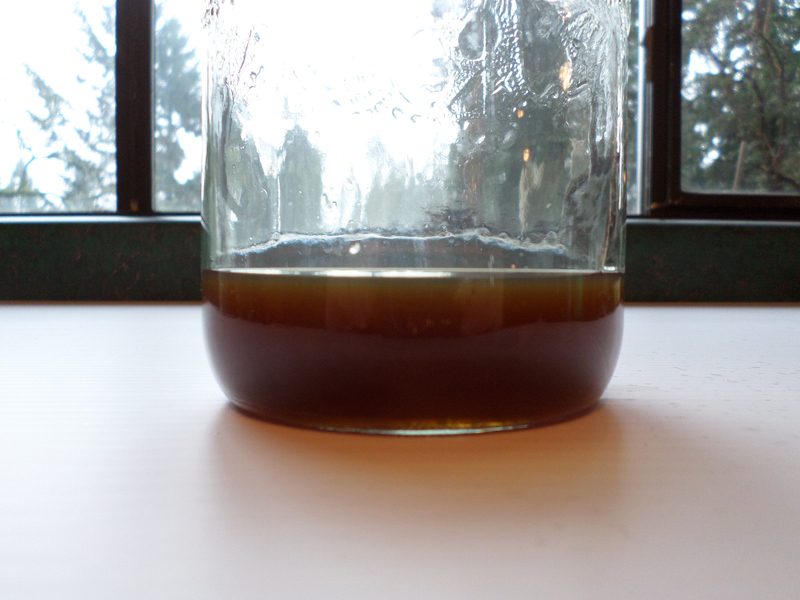 I am much better off dairy, which was why I started with water kefir. Kombucha is on my list of things to try, I’ll blog about that when I try it.